Juniata Mennonite’s Alicia Glick, right, fights for ball position against DuBois Christian’s Keisha Frasier in a girls soccer game Thursday in McAlisterville. 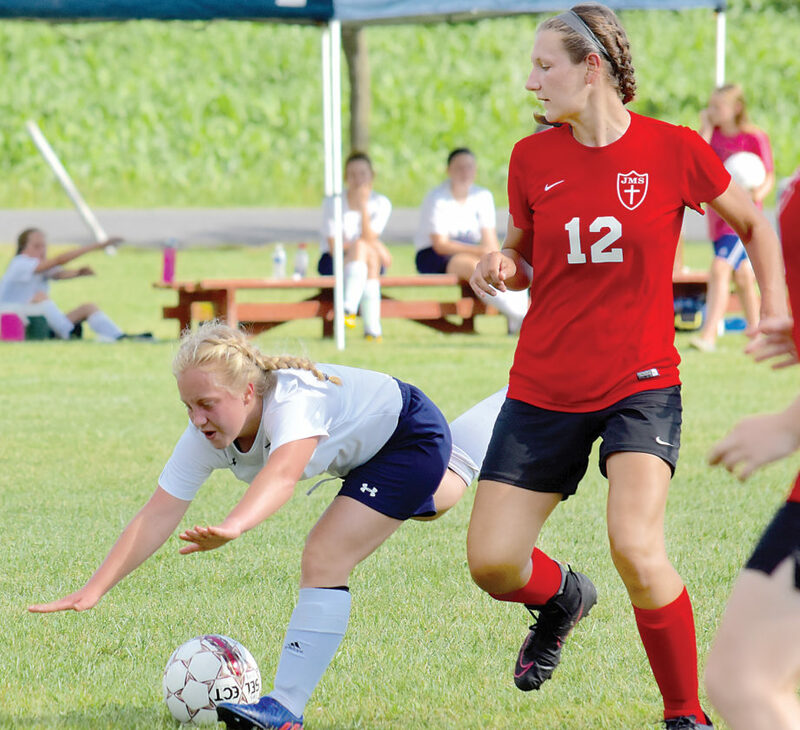 McALISTERVILLE — Juniata Mennonite was lights outs offensively in the first half which helped carry the Lions to a 6-0 win over DuBois Christian their girls soccer season opener Thursday. The Lions came out the gates swinging as with just 20 seconds into the first half Juniata Mennonite got on the scoreboard when Autumn Martin found Reanna Hoover who proceeded to send the ball to the back of the net giving the Lions a 1-0 lead. Anna Taylor kept the pressure on the Eagles when hustling up the middle but her shot went wide. But then Taylor had another opportunity. In fact, she had two as her first shot bounced off the Eagles goalkeeper Emily Deitch right back to Taylor who extended the lead. Juniata Mennonite had several more chances to score but either failed to execute or were stopped by the DuBois Christian defense. However, with 15:21 left in the half, Annika Martin blasted one over Deitch’s head to make it 3-0 Lions. Martin did not stop there as about three minutes later a scramble ensued near the net where the ball bounced back to Martin who drove it in giving Juniata Mennonite a 4-0 lead going into the break. “We felt comfortable with it. 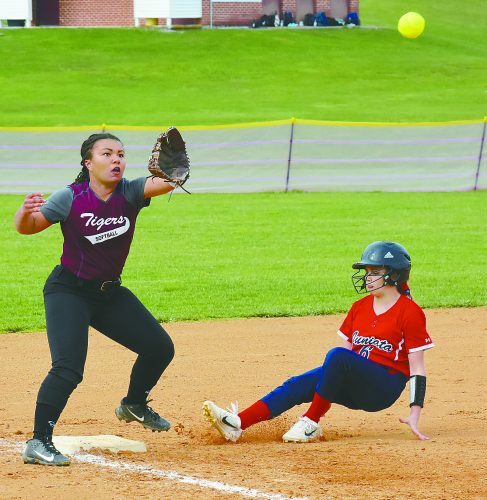 I know that a couple of their girls up top really put some pressure on us and our girls handled it well,” Todd Taylor said. Things started off a little different in the second half as the Eagles brought the pressure on the Lions, creating several opportunities to close the gap but their efforts were thwarted by the Juniata Mennonite defense. Once the Lions got things settled down, they went on a tear themselves as Martin looked to add on to the lead but missed the shot. Not long after with 34:04 remaining in the game Hoover fired a rocket past the keeper to extend the lead to 5-0. Hoover contributed another way later on in the second half as she moved the ball over to Halle Brown who scored the Lions final goal of the game. Hoover led the Lions with two goals and a assist. One of the biggest things that Juniata Mennonite wants to work on this season is its new defensive gameplan. It certainly looked as if the team responded well to it as the Lions kept goalkeeper Rachael Delancey extremely relaxed in the net only having to face four shots on goal. The Lions had 20 shots on goal in the contest. Juniata Mennonite (1-0) will look to keep the winning ways going as the Lions host Great Commission today. JMS — Reanna Hoover (Autumn Martin), 39:40; JMS — Anna Taylor, 33:24; JMS — Annika Martin, 15:21; JMS — Annika Martin, 12:40. 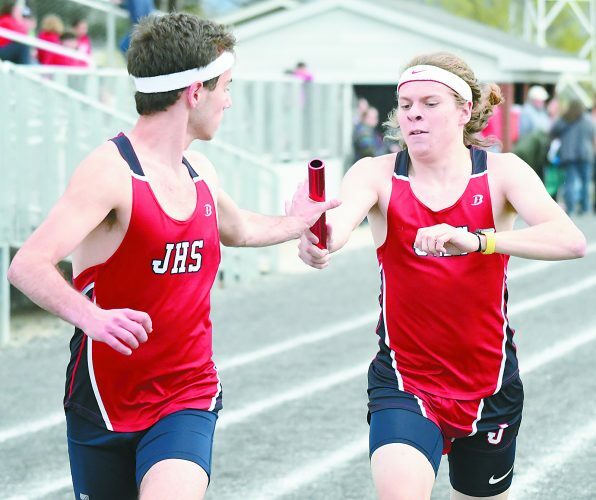 JMS – Hoover, 34:04; JMS — Halle Brown (Hoover), 10:53.